Two years ago the new show concept “Unser Star für Oslo” - finding an adequate singer with the perfect song worked out very well. This year the show “Unser Star für Baku” has fatigued the German audience, as there are quite a lot of casting shows already. The viewing figures decreased from show to show – there were eight shows altogether. For future planning the organizers should think of a different show concept like they have it in Sweden for example. Or they take the winner of the “Bundesvision Song Contest”, which has strong similarities to the ESC, every county like Bavaria or Lower Saxony sends a song and a singer and there is a voting like in the ESC – the show is tremendously popular. In the German final there were two singers left with three songs each. With a small margin of 1% Roman Lob convinced the TV viewers. The song “Standing still” is a moderate pop song, written by the famous composer Jamie Cullum from England, who might be known for its own song “It’s all over now”.Roman’s voice perfectly suits to the song with a nice chorus and climax at the end. 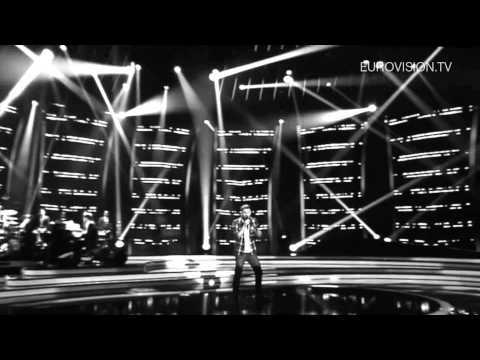 This song can easily played in all radio stations, it does not sound like a typical Eurovision song. Roman persuades with his naturalness and good voice. Following Lena’s footsteps he needs to work on his show, something unique and striking on stage is essential. This is another strong song from Germany again. For the 57th time Germany will compete in the 57th Eurovision Song Contest this year. In the very first year there were two songs allowed and in 1996 Germany has not been qualifying for the final, that’s why there are 57 entries so far. With such a strong enthusiasm of participating year after year there were only two, but very distinguished winners: Nicole with “Ein bißchen Frieden” in 1982 and Lena Meyer-Landruth with “Satellite” in 2010. A lot of people believed that it needs a miracle for Germany to win again, due to the increasing number of participating countries the competition is getting tougher. On the other hand Germany belongs to the Big 5 countries – the biggest financiers of the EBU – so therefore these countries get a granted place in the final and they don’t have to qualify anymore. The other Big 5 countries are United Kingdom, France, Spain and Italy. Over the years there have been many good places in the Top 10 like “Theater” by Katja Ebstein in 1980 (2nd), “Johnny Blue” by Lena Valaitis in 1981 (2nd), “Für alle” by Wind in 1985 (2nd) and “Lass die Sonne in Dein Herz” by Wind in 1987 (2nd). A remarkable respect for Ralph Siegel, who wrote 3 songs of them as well as two third places “Wir geben ‘ne Party” by Mekado in 1994 (3rd) and “Reise nach Jerusalem” by Sürpriz in 1999 (3rd). The general interest in the contest changes from year to year, especially after Guildo Horn’s “Guildo hat Euch lieb” (7th) in 1998 the Eurovision-fever has reached the entire country. In 2010 when Lena entered the contest and finally won it, the atmosphere has reached another height again, Germany loved Lena – young and old, everywhere have been Eurovision parties and there has been a great welcome reception at the Hanover Airport and on the terrace of the Hanover town hall, she has been congratulated by the German president itself and of thousands overwhelmed fans when she came back. The year after, Germany could show the rest of the world the latest stage technology and how the Germans can celebrate at the 56th ESC in Düsseldorf. The contest was a big success for the city of Düsseldorf (see the article in the news), for the ESC and last but not least - the positive image of Germany as a Eurovision-crazy-country.